In the early days of TV, the program schedules were mailed to customer's homes, placed in newspapers, or handed out for free by radio and television dealers. There were only a few hours of television per day, and one or two channels per city, so the schedules were short. This page gives the history of early program guides, prior to today's national "TV Guide". The first two TV stations licensed for commercial broadcasting were New York’s WNBT (which later became WNBC) and WCBW. They were both licensed on July 1, 1941. Earlier broadcasting was considered 'experimental'. 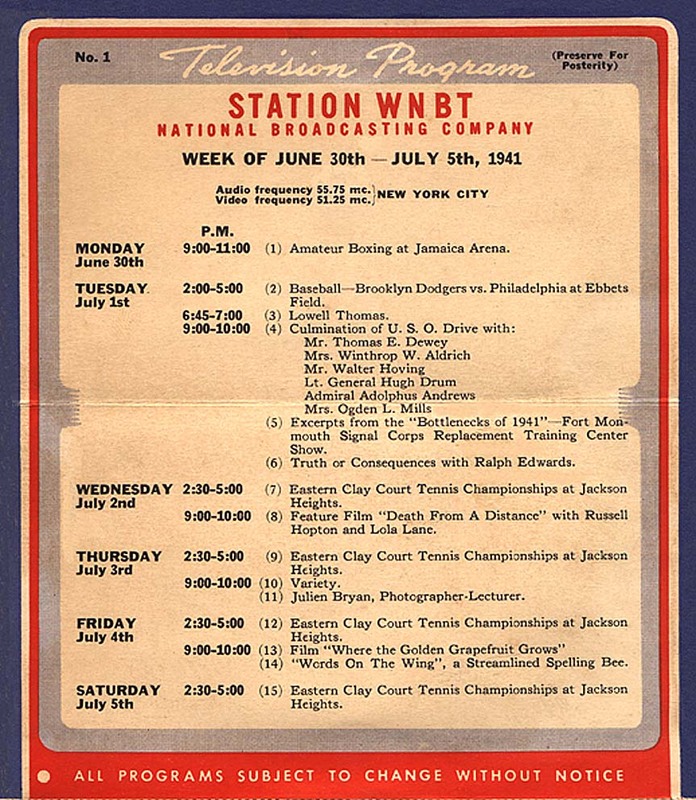 Just prior to the official 'first day' of FCC-approved commercial broadcasting, television station WNBT mailed "Program Cards" to New York area set owners. At that time, there were less than 7,000 television sets in operation nationwide. Mr. Robert Fendrich's father (Leo) received one of these 5-3/4" x 10" cards. The top line of the card says: "No. 1 -- Television Program -- Preserve for Posterity". Leo kept this card as suggested. We are now at the 60th anniversary of this historic event. This Opinion Card is attached to the bottom of the guide -- NBC asked owners to fill this out and drop it in a mailbox (postage pre-paid). This card was not mailed, so we thankfully have an example to post here. At the onset of World War-II, worldwide television broadcasting was curtailed or halted completely. The country most drastically affected was England, whose TV broadcasting was shut down from noon, September 1, 1939 until June 7, 1946. Approximately 19,000 TV sets were operating in the London area at that time. In the United States, commercial broadcasting was unaffected until 1942. At that time, virtually all stations went dark with the exception of DuMont's WABD, in New York, who broadcast (with a reduced schedule) throughout the war. Less than 20 stations were in operation nationwide, in the pre-war period. TV was used (among other things) to entertain the troops, provide updates on the war, and to teach the public civil defense and demonstrate emergency first-aid procedures. Not much survives about the day-to-day programming, but we do have some examples of Program Postcards that were mailed to the approximately 2,000 owners of television sets in the New York area. A few examples from this time period are shown below. 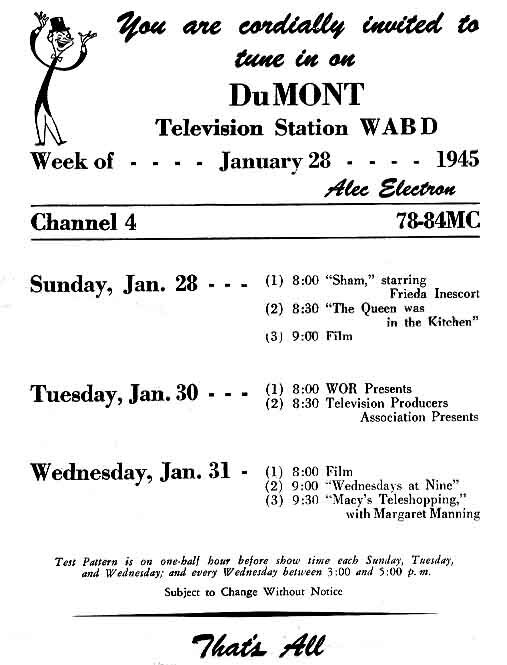 (50K) -- Week of January 28th, 1945 -- DuMont television station WABD -- Channel 4 -- Program Postcard. Notice that programming was limited to three days per week, about 1 or 2 evening hours on each day. Also interesting is that a "test pattern will be on one half-hour before each show time .." This was to allow set owners time to make the necessary adjustments for good reception! Times sure have changed! 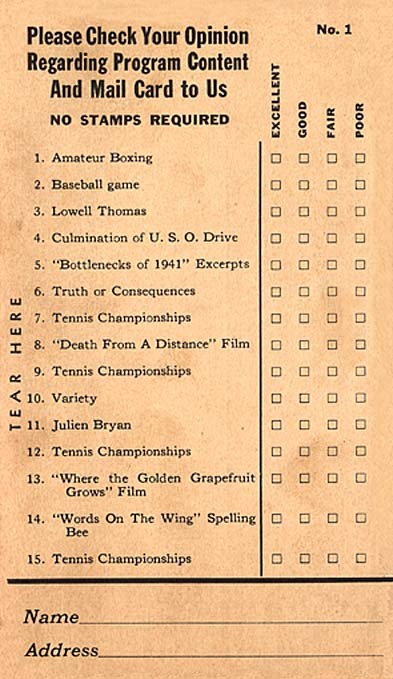 (72K) -- Typical wartime Program evaluation card. Viewers that were kind enough to mail this card back to the station helped provide feedback as to which shows the TV-owners enjoyed most. 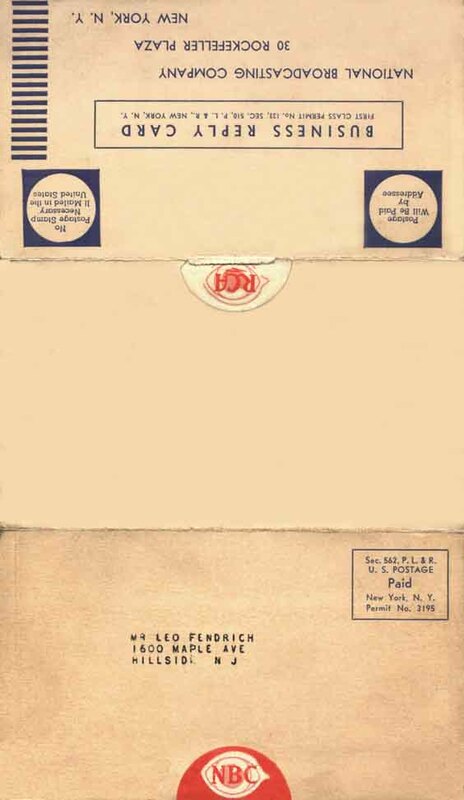 This WNBT card was mailed to set owners on April 20, 1945, announcing the impending coverage of V-E day. (100K) -- Here is a later DuMont card, (now Channel 5), for the week of January 6th, 1947. Program postcards were used until about 1948-49 in the United States. Notice that by 1947 programming was Monday through Friday for DuMont. One example of a program leaflet is this October 1947 guide called "On The Air" for KTLA (Channel 5) and W6XAO (Channel 2) for the Los Angeles area. This particular guide was primarily for radio programs, with a 1/2 page devoted to TV. The front cover says these were updated once a month! (38K) (242K) Note: W6XAO was the first TV Station in Los Angeles. It later became KNXT, and is now known as KCBS. The Humble Beginnings of "TV Guide"
After the leaflet and postcard era, three local "television guide books" began their existence on different dates in the year 1948. They were Chicago's Television Forecast, Philadelphia's Local Televiser, and New York's Television Guide. Each has a unique story on how they got started. The three little magazines eventually became the national TV Guide, with the first issue released on April 3, 1953, showing Desi Arnez IV (Lucy's Baby) on the cover. 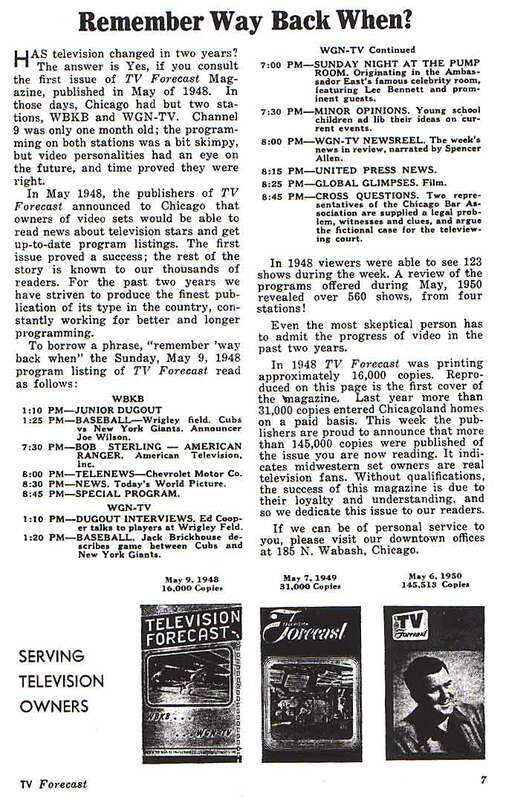 The first continuously published "TV Guide" type magazine, in the United States was launched in Chicago, on May 9, 1948. It was called "Television Forecast". There were 18,500 TV sets in Chicago, and about 300,000 sets in the whole USA. The owners were Mr. Les Viahon and three other ex-GI buddies. Each chipped in $250 and started publishing the magazine in the basement classroom of Abbot Hall on the Northwestern University Campus. They were so broke that they bound their first issue with staplers borrowed from the professors upstairs! The group managed to obtain (from a TV dealer's association or such) a mailing address list of everyone in the Windy City who had purchased a TV set, and then for several months mailed the publication free, as a "programming service". On August 8th, they began charging $3.00 per year (Charter members $2.00 per year). The first issue distribution was 16,000 booklets. Later press runs were in the tens to hundreds of thousands, but nearly all the copies were tossed out, once the next week's issue became available. May 6-12, 1950 -- Shows early publication quantities & history. Here are the 'official government audit publication figures' - the numbers represent the "average" print quantities from the previous year (weekly quantities summed together and divided by 52). The date in the parenthesis is simply the specific week that the report appeared in the magazine. The 1948 report did not appear until the May 6-12 issue, 1950, for instance. Shown below are several issues from this first two years of this magazine, including Issue One. Click any image to enlarge. Use the browser's "Back" button to return to this page. A completely different story can be told about the Philadelphia TV magazine. There were two brothers living in Philadelphia by the name of the Irvin (b. 11-23-24) and Arthur Borowsky, who were in the commercial printing business. Their business was called "North American Publishing Company". In 1948, they dreamed up the idea of publishing a little 8-page TV program guide that could be used as a promotional piece to increase television sales. The brothers received a commitment from local Philco television distributors to pay half of the publishing costs, as well as provide them with TV ownership lists, which were then prized, because owners were still such a novelty. For a $3 subscription fee, the brothers mailed their guide to set owners, printing on different-colored paper each week in an effort to appeal to housewives. The first issue was launched on November 7, 1948. 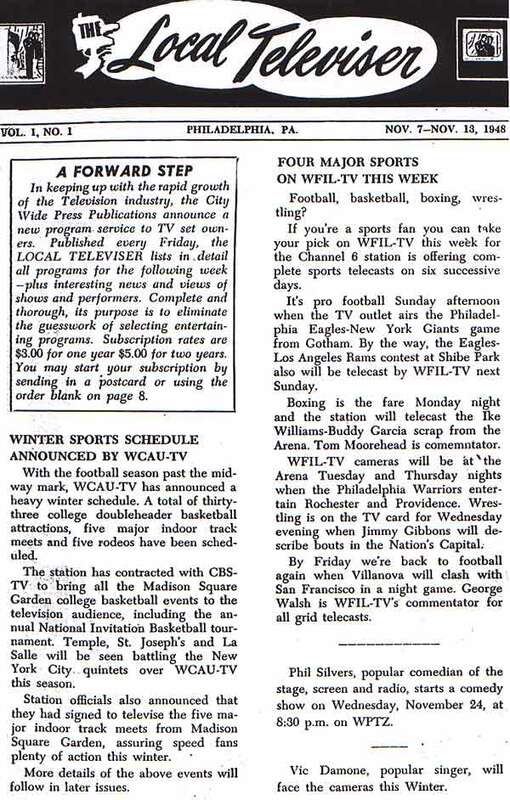 The first issues of the publication were called: "The Local Televiser" (not Televisor). Later the name was changed to "TV Digest". Without a doubt, these early magazines are the rarest of the three publications, and are nearly impossible to find today. I am pleased that Mr. Bob Reed has written me and provided copies of Volume One, #1, and Volume One #2. He is an advanced collector of pre-national TV guides, who thru diligent research and persistent efforts, located the still-living Mr. Irvin J. Borowsky. In a July 1998 communication, Mr. Borowsky had his secretary forward copies of these issues, to Bob Reed, from the corporate records. They may very well be the only copies remaining on earth. (94K) Click here to see the entire first issue! In New York, TV Guide (Pre-national) was founded in 1948 and published by Mr. Lee Wagner, a lawyer who had been circulation director for several movie magazines at the time. The earliest New York pre-national TV Guide issues from 1948 are scarce, although they do occasionally appear in Internet auctions. The first issue is dated June 14-20th, 1948. Click here to see some of the pre-national New York TV Guides. To See a Timetable of the Pre-National TV-Magazine Launch Dates, click here. To learn more about these early pre-national TV guide books, click here , then type "1948" in the Search Box, and hit "FIND"
Get on time success in 640-816 Practice test exams by using our latest and high quality 640-553 Practice test. We provide a foundation of broad and deep understanding here. Beside these exam papers, we also facilitate you with bolero jacket. Guys if you are looking to save on batting gloves and ski gloves then you must join us today.